First, they steal Nelson... now this? 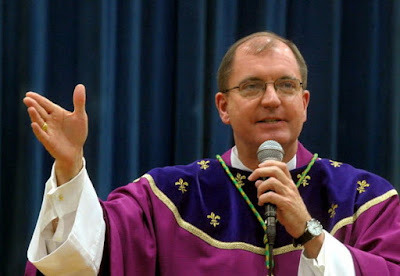 Continuing Long Island's raid on the Southeastern Pennsylvania talent-pool (well, what's left of it), at Roman Noon this Friday the Pope named John Barres, the 56 year-old bishop of Allentown since 2009, to the helm of the 1.5 million-member fold based at Rockville Centre in Nassau County – the nation's first, and still largest, all-suburban local church, and one of the US' 10 largest dioceses all-around. The Ivy-bred son of converts – baptized by Fulton Sheen and a student of basketball under Princeton's legendary Pete Carrill – Barres succeeds Bishop William Murphy, whose retirement was granted 19 months after the Boston-born iconoclast reached the canonical age of 75. The Installation is set for Tuesday, 31 January in St Agnes Cathedral, whose John McGann-era whitewash was recently undone in part by a $4 million renovation. Catholic New York's second "shoulder replacement" in as many months – following November's watershed move on the 1.3 million-member Newark archdiocese that saw "His Grace" yield to His Eminence – at least this time, the arrival of the Pope's pick isn't an occasion of shock and awe. While Barres has topped the lists for practically the entire duration of the Island's long wait, even more than has usually been the case, nothing in the current process can be taken as a "lock" until the Final Nod arrives, all the more given a considerable revision of the Stateside files reportedly taken up by Archbishop Christophe Pierre upon his arrival last summer as Nuncio to Washington. Given said state of things, it's fairly impressive to see the early front-runner emerge as Rome's choice – all the more in a very sizable, strategically important post which would garner more than ample interest behind the scenes. If anything, then, the choice of a figure who easily evokes comparison to Murphy – albeit in a more "digitized," less contentious form – signals a firm vote of confidence in a tenure which has provided a remarkable sense of stability amid no shortage of epochal storms... just the first of which came all of six days after the now-retiring prelate was installed, when the 9/11 attacks took a shattering blow to the life of the diocese.